Film Updates and Winter Fun! A beautiful white snow is spread across the landscape. The steamy coffee tastes good on a morning such as this. I did a special mid-week blog based on a fan email I received earlier in the week. It was one of those emails that just deserved a response. I’m happy to see how woven our Civil War film “Wicked Spring” is into the fabric of films in that genre. How schools are using the film to stimulate discussions among the students. I encourage my weekly readers to go back and read the previous blog. 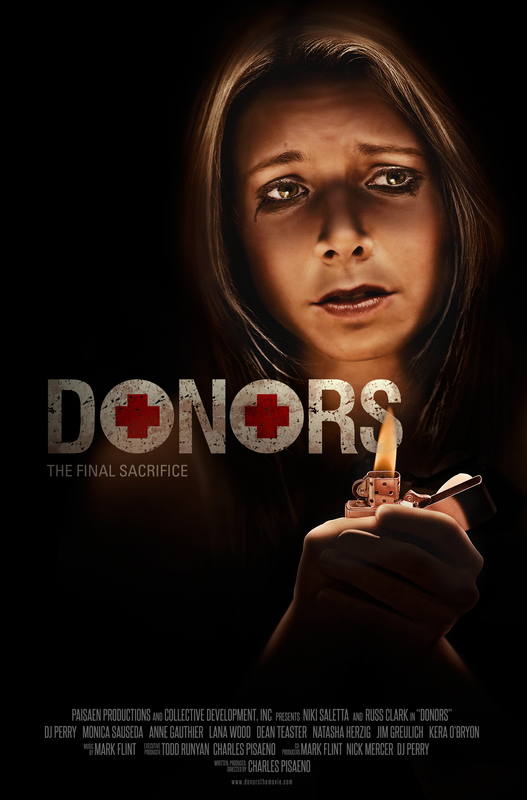 Our 1st look at the “Donors” teaser poster was released this week. We also announced the addition of more cast onto the project such as the beautiful Anne Gauthier whom I shared the screen with in “Darkest Night” and Lana Wood, a legend. Post work is underway and I think a 1st trailer will be following soon. “Deadly Renovations” is being prepped for Hong Kong film market in March and our DVD/Blu-Ray extras are being delivered this week. I’m excited to see what countries are interested in our thriller. I’m still trying to get exact street dates on our New Video titles. I’m told that the Michigan showing of “Locked in a Room” will be in May. I also hear that “7 Stones” will be polished up and submitted for showing at the Waterfront Film Festival in Saugatuck, Michigan. I still have no dates on “Benjamin” showings yet. “Darkest Night” will be ready to shop at its theatrical run-time in April. Development continues and progress is being made on the various films. Verbal talks are underway and I soon may announce my involvement in a film next month. I will hint by saying that it would be the 1st sports film I’ve ever done. I’m also close to closing a deal on a film in April. There is a chance that one of our films may go up in that month if I don’t do the April project. I’m also close to signing a deal memo on a June/July film that shoots in 3 states including Michigan so that would be great. I’m also waiting on news on “Supermodel Showdown” the TV show I worked on in Costa Rica. Creator Joe Murphy was supposed to take a look at it and get back with me. I think it is coming out on Telemundo/NBC here soon. We use to roll with Big Cat to Night of a 100 Stars on Oscar night and perhaps I will attend again soon but not this year. I’m sure Hollywood is buzzing with excitement and I know the artists there will party hard. Well I’m going to do some work this morning followed by some domestic activities. The dogs love the snow so that might be in the future. Also might run to go get bottles for the next batch of wine that is to be bottled. This is the 1st teaser poster on "Donors"
This entry was posted on February 25, 2012 by DJ Perry. It was filed under Blogroll and was tagged with dogs, donors, films, snow, winter.